A bordello doorman in West-Berlin wants the Wall and his past back. The Yugoslav immigrant Dragan Wende used to be the street king of West-Berlin’s 1970s hedonistic disco scene. Along with his friends, he roamed the nightclubs on both sides of the Wall – his pockets full of Western money. But when the Wall fell, everything changed. 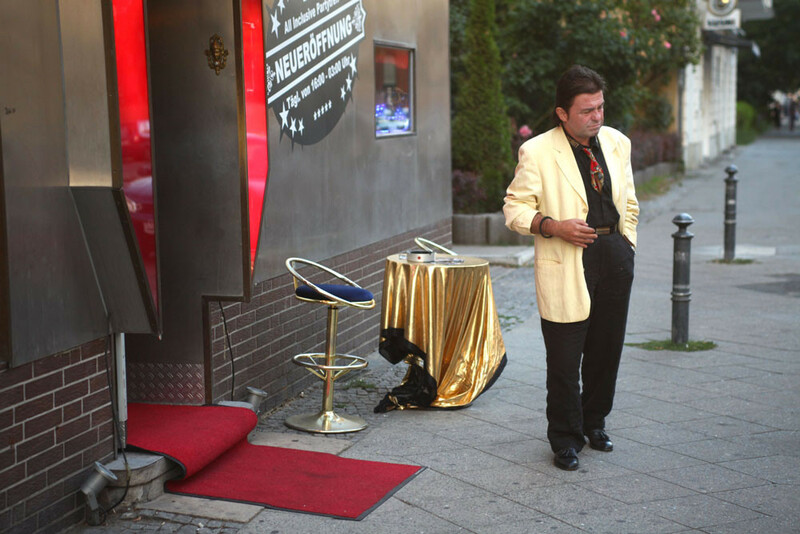 Dragan has not set foot in East Berlin for the past 20 years and has no intention to do so. A microcosm of underdogs and their survival strategies unfolds as a tragicomedy in a still-divided city. Lena has been working in documentary films since 2007: she developed, produced, directed and distributed documentaries all over the world. She is half German and half Yugoslav. Grew up in Berlin and in Paris, studied Philosophy, Political Science and Economics at Oxford University, worked for a human rights think-tank in Belgrade devising large-scale civil society projects, turned to acting in theatre. She founded a theatre and film collective in Berlin, worked for documentary companies and gained her Master in Film Studies at King's College. Founded von.müller.film, was part of ExOriente & the Nipkow Programm, and works for BBC Worldwide. Her documentary Dragan Wende-West Berlin won Best Documentary Award at Max Ophüls Preis and in Trieste. FAM – Women on Monday (2009),Dragan Wende-West Berlin (2013). Dragan grew up in South Serbia. He studied philosophy at the University of Belgrade and worked as a sports journalist for the TV station Studio B. He finished the AFC Film Directing School before enrolling in the Film Editing Department at the Faculty of Dramatic Arts in Belgrade. He attended various film workshops including: Ex Oriente, Berlinale Talent Campus, Nipkow Programm, Zagrebdox Pro. He won the AVID editing award at the Kurzundschön Festival in Cologne and 1st prize at the Belgrade Alternative Film and Video Festival. He works as a freelance film editor on creative documentaries and fiction feature films. The House of Asterion (2003, short), Dragan Wende-West Berlin (2013).